"So what do you do?" Now that's a million-dollar question! Everyday you meet people who could use your products or services. But unless you tell them what you do in a compelling manner, those relationships go nowhere. 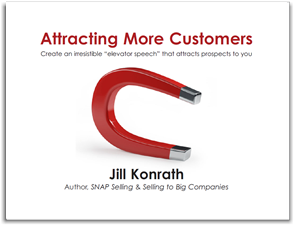 5 critical steps to crafting an elevator speech that differentiates you from your competitors. How to connect with your prospect's head & heart. How to use your elevator speech to achieve maximum impact. 10 essential questions to evaluate your elevator speech. The Result? More hot prospects and lots more referrals.